Milton Friedman has long believed Hong Kong to be the model success story of laissez-faire economics. In the eyes of the World Trade Organization, the ex-colony’s status as the world’s freest economy is an ideal for the rest of the world to aspire to. In reality, the ‘capital of capitalism’ is anything but non-interventionist and the city today should stand as a warning to libertarians and corporate defenders the world over. Although the territory has seen a huge growth in the number of millionaire residents, the local census Gini coefficient shows inequality to be at its highest level for 30 years. As it celebrates 15 years of Chinese rule, the UN Development Program states that the wealthiest 10 per cent of the populace control more than a third of the city’s income, while the bottom 10 per cent share only two per cent. A meagre minimum hourly wage of US$3.5 was only introduced last May and, with little corporate regulation or competition controls, a small handful of rich tycoons and their conglomerates reign freely. It has resulted in Hong Kong having the worst inequality of all OECD members: a fact that should make it a poster-child for the failures of ‘free trade’. Yet income disparity is only set to worsen as the ageing population and low birth rate give rise to an ever-shrinking workforce. Meanwhile, the red hot housing market, teeming with mainland speculative buyers, has become the chief cause of misery for many, as a tight oligopoly of property magnates are allowed to run riot. An estimated 5,000 people live in 15 sq ft squalid ‘cage homes’ – tiny shoebox dwellings subdivided with wire mesh and often shared between over a dozen other occupants. 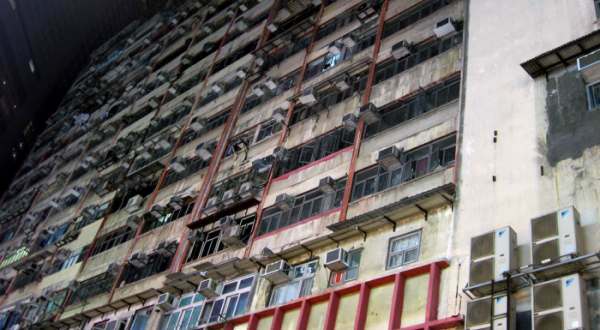 Not only does Kowloon boast one of the world’s highest population densities, but the rental market is also among the world’s most expensive with the poorest actually paying more per square foot than those in lavish apartments. Signs of inequity and the effects of an inadequate welfare system are also visible on street level, with elderly folk rummaging through bins for recyclable items to sell being an all too common sight. But far from being the non-interfering entity Friedman admires, the inevitable poverty gap has forced the state to intervene massively in key sectors. Just under 50 per cent of the population reside in rental or subsidized-sale public housing and there remains a years-long waiting list. The average income of the bottom 10 per cent stands at US$267 per month and, with no proper retirement protection system, few can afford private education or healthcare. These are therefore provided by the state along with sweeteners such as personal US$700 bailouts to all residents this year,subsidized electricity bills and free public housing rent for two months. Where Hong Kong certainly does fulfil corporatist fantasies is in the political arena. Full universal suffrage has long been postponed in favour of a small circle of business groups agreeing upon new leaders (with Beijing’s blessing). It gives CEOs and other special interest groups a level of voting power which is equivalent to tens of thousands of actual residents. In some ‘functional constituencies’, all eligible voters are legal entities rather than actual people – a true representation of ‘corporations as people’. Would-be voters were deemed too ‘immature’ for full democracy during both the 2007 and 2012 Chief Executive elections. ‘One person, one vote’, as guaranteed by article 45 the mini-constitution, has now been deferred, again, to 2020. Hundreds of thousands of pro-democracy protesters marched on July 1 as Chinese premier Hu Jintao inaugurated millionaire ex-property consultant Leung Chun-ying into office. Braving the intense heat, many nostalgic demonstrators even wielded British colonial flags, demanding full democracy and condemning the recent crackdown on dissent in the mainland. Hong Kong’s previous leader, Donald Tsang, openly admitted before stepping down that laissez-faire economics had proven to be flawed. ‘I used to believe that different social stratums could enjoy the fruits of economic development as a result of the trickle-down effect. However, there were discrepancies between the theory and reality,’ he told lawmakers. Let the city act as a warning that the ‘invisible hand’ does not create social justice and those pushing for ‘small government’ will end up relying on the government to pick up the pieces and fill in the gaps. It is left to an already-disliked Leung to address income disparity, tackle the housing crisis and stem growing anger and mistrust of the central government, which is at a post-’97 high. As for democracy, the city could so readily be a testing ground for greater freedoms across China – a democratic showcase which would prove to the state’s top brass that they have little to fear. When the Special Administrative Region’s five decades of autonomy finally expire in 2047, it is hoped that the mainland will bear a greater political resemblance to Hong Kong than vice-versa. It is only the tireless vigilance and value placed upon democratic freedoms by Hong Kongers which will prevent it from being the other way around.